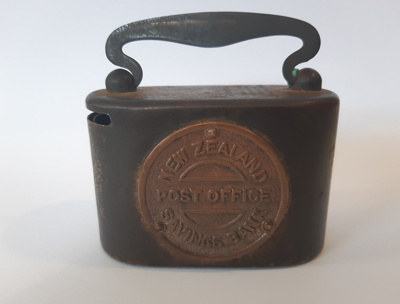 A New Zealand Post Office Savings Bank money box donated to us by local orchardist Graeme Johnson. First copper disc is embossed with the New Zealand Coat of Arms. The second copper disc is embossed with the words 'NEW ZEALAND POST OFFICE SAVINGS BANK'. The following text is stamped on top of the box: 'Richardson McCabe & Co, Wellington, Sole Agent for New Zealand R.H. Burman Ltd'. The number '83076' is stamped on the handle. On the slot side the text 'Coins and Bank Notes'.